We’ve long waited for an affordable Windows alternative to the MacBook Air, and while Lenovo’s new IdeaPad U300s looks great, it doesn’t appear to be competing on price in the soon-to-be-crowded Ultrabook market. The hardware specs of this 13.3-inch laptop matches the MacBook Air fronts, is arguably thinner, and starts at a reasonable $1200 (about $100 less than the entry-level 13-inch Air). Though the price compares favorably to Apple’s ultralight laptop, there are other manufacturers targeting sub-$1000 prices for some Ultrabook models this fall. You want second generation Intel Core processors? 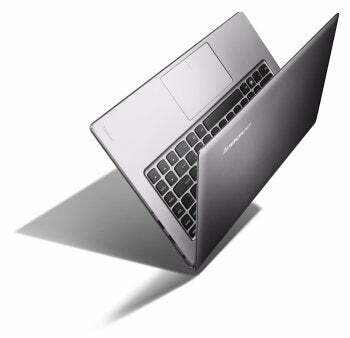 The IdeaPad offers both the Core i5 and i7 as options. Lots of memory and storage? Check. 4GB of RAM and up to 256GB SSD storage, like Apple’s offering. A shockingly thin, unibody aluminum shell? Yeah, the U300s is just 0.6 inches thick and weights in at 2.9 pounds (1.3kg). While the 13-inch Air is thinner at the tapered edge, it’s thicker at its thickest point and just a touch heavier. Whether you’re excited or bored by another MacBook Air lookalike, the U300s has some unique features all its own. In addition to the Graphite Gray color, you can get a Clementine Orange option to really turn heads. Lenovo claims battery life of up to 8 hours—about an hour more than current competitors. The keyboard is redesigned to be “breathable”: air flows through the keyboard to keep it cooler. There are lots of Ultrabooks announced recently (Asus has no less than five planned for October). The IdeaPad U300s is the thinnest we’ve seen so far, and Lenovo’s announcement has at least provided us with detailed specs we can drool over while waiting for the Ultrabook to be available for purchase. Unfortunately, we’ll have to wait until November.